Life is suffering! And I didn’t have to torture myself by starving myself to death nor sit around in forests to figure it out! Life IS indeed a vicious cycle of suffering to escape illness, and prolong old age and death. Meanwhile you fall in love, get married, have kids and according to most people who’ve been there and done that, it’s not a bed of roses. 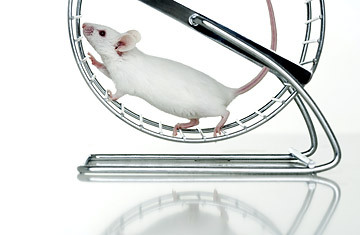 Suddenly I feel like one of those little mice put on a treadmill, a tired little mouse to be precise. Really, it doesn’t get any better does it? You get through school to be free of studies and just earn money and be free, and then comes the degree. Ok so university is fun but there’s more studying. Then you get married to your job before getting married to a person. It’s tiring and the treadmill never stops. Then, according to the people who’ve been there and done it, being married isn’t the most awesome thing that it’s advertised to be. Loving the imperfect person perfectly is tough tough tough and so is bringing up a new little human. You can no longer sleep. And from what I’ve seen during my short life in this big bad world, the word fidelity falls in the list of things extinct in the world today. *Gasp! * Forgive me for being paranoid now but really, how can you ever trust anyone? “He who loves 50 people has 50 woes; he who loves no one has no woes.” It’s just you against the world baby, and things are almost never what they appear to be. You can never fully know what’s going on in the mind of another human being, unless of course you plug him onto some high-tech equipment that can. Conclusion? We are mice! Yep, mice. On treadmills. Running running and running running, and running running and running running.